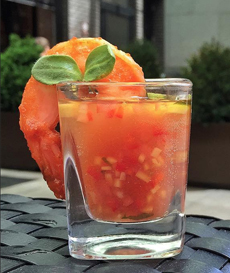  A gazpacho shot at Fabrick | NYC. A blender gazpacho from OuiChefNetwork.com. Here’s their recipe for their beautiful, orange-hued gazpacho. As the party is getting started, serve guests a gazpacho shot. Gazpacho, a chilled vegetable soup, is so refreshing on a warm day. Why National Gazpacho Day is December 6th, we have no idea. 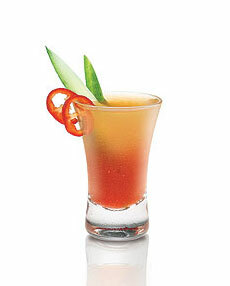 You can add a tablespoon of gin, tequila or vodka to each shot; or serve mocktails. A bonus: Even a small amount of gazpacho can add another portion of veggies to your daily intake. You can serve the shooter in a shot glass (you can buy decent ones in hard plastic) or four-ounce juice glasses. Or, ditch the concept of shooters and serve as a full-blown drink, in whatever type of glass you like. And, you can make them just for the family, with brunch or before dinner. 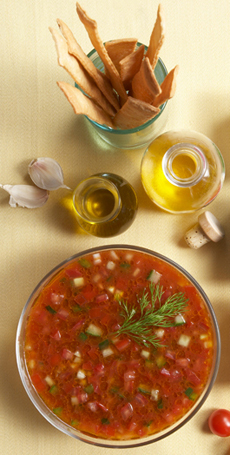 Just make your favorite gazpacho recipe (we have some recipes below). You can simply toss the ingredients into a blender. If you don’t like to cook, your food market may sell gazpacho along with the other fresh soups. Or, you can make the Gazpachito recipe below, a cross between a Bloody Mary and a Tequila & Lime shot. This is our lower calorie version, omitting the bread and the olive oil of a conventional recipe. It also works better for a cocktail. Simply layer the ingredients in a blender:. You can vary the vegetable proportions to bring out the flavors you like best. 1. 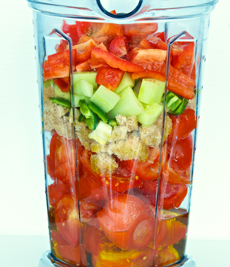 COMBINE the vegetables and seasonings in a blender and blend to your desired consistency. 2. TASTE and adjust the proportions and seasoning to taste. 3. PLACE the blender in the fridge to chill and allow the flavors to meld. Re-taste and adjust seasonings as needed. 4. SPLIT the batch. Add the alcohol to one portion, leaving a portion alcohol-free. If you know that all the guests will want alcohol, add spirit to the entire batch. 1. SHAKE the ingredients with ice in a shaker and strain into a chilled shot glass. Garnish with one or two cucumber spears. 2. SLAM the shot and then eat the garnish. Baby beets or diced whole beets. Celery or fennel stick of celery, broccoli or cauliflower floret. Cooked shrimp or a raw sea scallop, notched onto the rim of the glass. Greek yogurt, plain or herbed (mix in finely chopped fresh herbs); crème fraîche or sour cream. You can serve the shooters with a tray of crostini as crunchy counterpoint. Don’t like tomatoes? Make gazpacho verde, green gazpacho. There’s also the history of gazpacho. Don’t like tomatoes, onion and bell peppers? Make white gazpacho, which is the original gazpacho recipe. Tomatoes came later. Something Snazzy: Try yellow gazpacho, made from yellow bell peppers. Beer Gazpacho: This recipe, with added beer and salsa, is from Chef Rick Bayless. BLT Gazpacho: Make this recipe, or simply add a slice of crisp bacon and some baby arugula to garnish your favorite tomato gazpacho recipe. Fruit Gazpacho: Try Mango Gazpacho or Pineapple Gazpacho. Both are savory recipes with sweet fruit accents. Chocolate Gazpacho: The recipe is also savory, like mole sauce. A Gazpachito (photo courtesy Skyy Spirits). A bowl of tomato-based gazpacho (photo courtesy AddSomeLife.com).